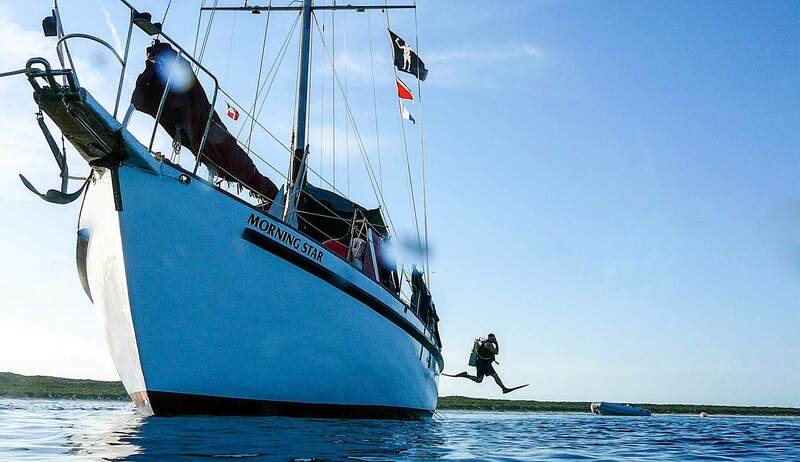 The Morning Star and Pirate’s Lady depart Nassau every Saturday for a week of live aboard diving in the Exumas, SW Eleuthera & Little San Sal in the Central Bahamas. The camaraderie and adventure on our live aboard dive trips keep divers coming back year after year. Our motto is “Twice the Fun for Half the Price”… you won’t get a better bang out of your diving dollar anywhere else! Dive the Caribbean’s largest underwater park, the Exumas Land & Sea Park. Divers can experience deep sea diving on the many beautiful walls. Sharks are a big draw for divers! See Caribbean reef sharks, nurse sharks, even tiger sharks on the sandy banks! Colorful reefs teeming with marine life sit in depths of 15- 80 feet so divers of all levels enjoy the scuba diving we offer on our Bahamas scuba diving vacations!